There are times when you are looking to give something different for that special occasion. Why not look at our goat milk soap gift sets? What better way to say "Thanks" or "You're Special" than with a great-smelling set of your favorite soaps? ... and anyone else that you can think of! We offer two varieties of soap sets. Both are packaged in clear cellophane bags tied with seasonal colors of raffia. 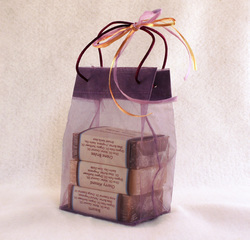 The best part is that you get to pick which soaps you would like to include in your gift bags. The first option is two bars of our hand crafted soap along with our cedar soap deck. You pick the two soaps from our variety of fragrances and we put your custom package together in a lovely organza bag (not shown here)! The cost of this option is $12.00 plus shipping and any applicable tax. Our next option is three of our great-smelling soaps in an organza bag. With this option you get to mix and match any of our three fragrances of soap. You can pick three of the same soaps or three different fragrances. Be creative! The cost of this set is $16.00 plus shipping and any applicable tax. No matter which option you choose, an all natural soap gift set is a great way to say, "I think you're someone special!"